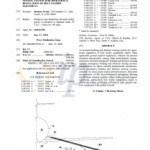 The USPTO has approved two patents (#7268676, #7583183) in support of AirVentions Inc. products. Applications have also been submitted with the Canadian Intellectual Property Office. ABSTRACT: An actuated braking and distance sensing system for operational regulation of belt loader equipment and/or other applicable ground support equipment, wherein the present invention incorporates, among other embodiments, spring-responsive actuated emergency braking and distance sensing systems, emergency braking and distance sensing systems implemented via linear variable displacement transducers, and/or emergency braking and distance sensing systems actuated via sonar, lasers and/or infrared sensors. 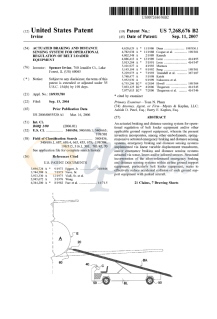 Structural incorporation of the afore-referenced emergency braking and distance sensing systems within airline ground support equipment, particularly belt loader equipment, seeks to effectively reduce accidental collision of such ground support equipment with parked aircraft. This entry was posted on August 26, 2010 at 12:48 pm. You can follow any responses to this entry through the RSS 2.0 feed. You can leave a response, or trackback from your own site.